Coventry Airport is a small facility operated by the Patriot Aviation Group. It is situated on the outskirts of Coventry, and currently serves only a limited number of flights and passengers. The airport was closed in 2009 due to financial difficulties, but reopened again as a more commercial operation soon after, in 2010. The facility operates as a commercial gateway for the West Midlands region of the UK, but presently no scheduled passenger flights are handled. The site is to be found to the south of Coventry city centre, close to the A46 and A444 roads, making for easy access to the city. It comes with just one, fairly small terminal building. The airport primarily serves private chartered flights into the West Midlands. Since its reopening, Coventry Airport has not expanded its commercial passenger operations. Most flights are cargo routes from Frankfurt, Lille and Dublin. These routes are flown by Nightexpress, RAF-Avia and West Atlantic airlines, respectively. 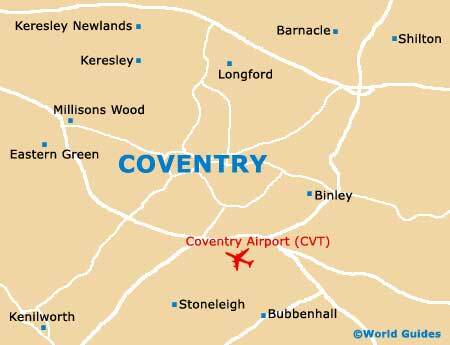 Coventry Airport is situated just 6 km / 4 miles to the south of the city, and 10 km / 6 miles west of Rugby. There is one asphalt runway and one grass runway handling traffic at this facility. Rowley Road, which is the airport service road, links to both the A444 and London Road. Both of these roadways eventually connect with the heart of Coventry, passing by Cheylesmore and Whitley. To reach the facility via the M6 motorway, turn onto the A46. Follow this motorway until it becomes the A45, from where motorists have to take the Rowley Road exit to reach the terminal. Book your Coventry Car Rental here. Head to Coventry city centre, its train station or its bus station by using the facility's bus service. The local 21W and 21 bus routes connect the airport to the Pool Meadow Bus Station, while bus route 539 offers connections to the Coventry Railway Station. Airports Direct is the main company providing taxi transportation for passengers. It is advised that passengers book a taxi prior to reaching the facility. Nevertheless, there are usually plenty of taxis at the designated rank outside the terminal. From the streets of Coventry, a taxi can usually be flagged down at anytime of the day or night for access to the airport, with this journey taking no more than ten minutes.